Lately I have been doing stories about Westconnex, a $14 billion 33 kilometre motorway from Parramatta in Sydney's West to Rozelle, across the inner west to Newtown and back out to Sydney's South West. As part of my background research, I started digging into the origins of Westconnex which led me to the all male Westconnex Delivery Authority Board that carries responsibility for the design and delivery of the project. Chairman of the Board is Tony Shepherd, a well known Sydney business leader and Liberal party supporter who has devoted much of his career to developing the role of private business in building and owning infrastructure. My attention was attracted to some intriguing court reports about his alleged role in ‘pushing’ traffic figures when, as a senior executive of Transfield Holdings, he was director of a consortium that bid successfully for the contract to build the Lane Cove Tunnel in Sydney's North. The tunnel failed financially although it was later rescued and remains open today. Back in 2010 when the tunnel collapsed, NSW Greens MP Lee Rhiannon, now a NSW Senator in the Federal Parliament, had been warning of the dangers of the privatisation of public infrastructure for ten years. She told the ABC reporter Bronwyn Herbert that the financial collapse of the Lane Cove Tunnel was no surprise. 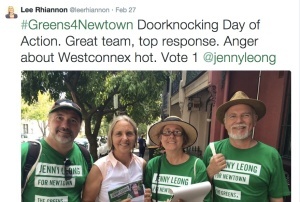 Lee Rhiannon, NSW Greens MP: There's no surprise that the Lane Cove Tunnel financially collapsed. There's been warnings about this for a long time. Bronwyn Herbert: Lane Cove Tunnel's financial woes centre on its foolish traffic forecasts a problem mirrored in other debt-heavy toll roads around the country. From Brisbane airport link known as BrisConnect, to Melbourne's ConnectEast Motorway, and Sydney's controversial Cross City Tunnel, which also went into receivership. Lee Rhiannon: The Public Private Partnerships model is really a spin that was brought forward by the industry, by the Government to try to make out that there's partnership. But all the time what we see is the public are the losers. The NSW Labor government which had then been in power for fifteen years had embraced private tollroads but even the then Minister for Transport David Campbell was worried by the false predictions for the Lane Cove tunnel. But Tony Shepherd, who was then CEO of Infrastructure Partnerships Australia, a lobby group that was promoting private tollways, had few regrets. For him, the collapse was a mere hiccup in his long campaign to defend the privatisation of Sydney's infrastructure. That investors have lost money is a great disappointment. But those investors you know win and lose on various projects over many years and they'll come back into the field next time they'll be more cautious. But I'm sure they'll be there. I think that private sector's big and ugly enough to look after itself. I think the private sector has got the capacity to learn the lessons. One thing which will not happen in the future will be there'll be no upfront payments from the project developers to the Government for the right to toll. Read the rest of Bronwyn Herbert's illuminating ABC 730 report. Shepherd was right about one thing. The private sector is big and ugly enough to look after itself. He and others worked with government to 'help' it come up with a new model. As you may have noticed with the the Westconnex, the new model is one is which the taxpayer, not the tollroad company, carries the risk. The court case about the dodgy figures was settled so I can't bring you any more news about how and why the Lane Cove Tunnel traffic figures were so inflated. But given that Shepherd is now in charge of one of the biggest infrastructure projects in Australia, it seems to me that the Lane Cove tunnel fiasco might be of considerable public interest. As I often do these days, I posted a tweet. It attracted several retweets. As the SMH reported last Monday, two days after I posted the tweet, I received a letter from Ash St Partners, acting on behalf of Shepherd. The letter included the original tweet. The letter warned that if I did not comply, Shepherd reserved the right to apply to the court for 'relief' (damages), including payment of his costs. Meeting such demands would've cost thousands of dollars, certainly far more than an average person could afford at such short notice. On the other hand, not doing as requested, risks even more. Tweets are publications like other forms of publication and can be the subject of defamation actions. So I replied that I was seeking advice. Shepherd's lawyers then granted me several more days. A few days later, I wrote to Ash Lawyers explaining to them that I wouldn't comply with their demands. 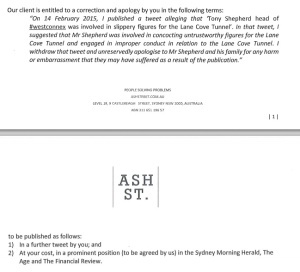 I asked them to send me any evidence or denials that countered the SMH court report about the Lane Cove Tunnel case. I stated that I would include relevant information in future reports. Believing that the public should know about how defamation threats work to silence journalists, especially small independent ones, I gave the letter to the SMH and publicised news about the threat on twitter. I received a further letter in which Shepherd's lawyers wrote that the publications and republications were 'clearly defamatory' and that it was up to me 'to justify' my conduct. The author reminded me that I would be liable for retweets and even suggested that I would be liable for the comments of others. He complained about the ‘leak’ of the first lawyers’ letter to the SMH and the publication of information about the legal threat. In their view, my conduct has demonstrated 'malicious disregard' for the reputation of Tony Shepherd. Court action was again threatened. On Friday. I sent a short letter to Ash St lawyers. The defamation threat has spurred my interest in Shepherd. Why would a small tweet worry him so much? As CEO and then Chair of Transfield Service and Chair of Abbott's Federal Commission of Audit, Shepherd can justifiably claim to have played a significant role in shaping Australia's increasingly privatised economy. He was awarded an Order of Australia while Labor was in power in 2012. Under his leadership, Transfield, which began as a construction company, entered whole new worlds of coal seam gas drilling, running off shore detention centres, and defence weaponry. As Rhiannon argued at the time of his appointment as Chair of the Commission of Audit in a different political world, Transfield's generous political donations and lobbying activities might have disqualified him as a suitable Chair of a supposedly independent audit of the nation's economic choices. On the other hand, if your goal is privatisation, he was a perfect choice. You can read more about Shepherd in my New Matilda backgrounder. I also recommend Ian McAuley's analysis for New Matilda of the failings of Shepherd's Commission of Audit report. My response to this incident has been shaped by a life of experience with the defamation laws that are a major cause of self-censorship in this country. I strongly recommend that if you end up in the same situation, you should seek advice from a person who understands defamation law. Although it's definitely best to ask a lawyer what to do, I'd also recommend getting a strong basic knowledge of the law so that you know what evidence you need and when you are likely to strike problems. A good text for Journalists is Mark Pearson and Mark Poldan's Journalists Guide to the Media Law ( Fifth edition). I know from other research into 'stop writs' - legal steps taken with the purpose of silencing community members or publishers - that defamation threats can be very intimidating for community groups, activists and journalists. My first experience with censorship was as a student editor in 1970. Those experiences were with the laws of obscenity. In many ways, they shaped my life in fundamental ways. They certainly opened my eyes to the injustice, discrimination and lack of opportunity that are key characteristics of the legal system. I also became aware that many significant stories remain hidden because they do not fall inside mainstream news agendas. Sadly, a large part of reporting simply amplifies the views of powerful people and interests. These days, it's called 'churnalism'. These early experiences led to my first serious daily reporting experience. The occasion was a defamation trial. In 1972 after I had been briefly in Mulawa Women's Prison on remand following a censorship trial, Staples told me that he was representing Pat Mackie in his defamation trial against Frank Packer's Daily Telegraph. 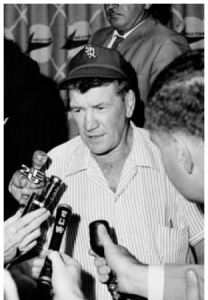 ( Packer was the father of Kerry. He was an extreme conservative who hated unions and funded the campaign that brought the Liberal Askin government to power in 1965.) Mackie who was a household name back in those days was a leader of striking miners in the 1963-64 Mt Isa Mines dispute. A young barrister called Mary Gaudron appeared with Staples. The trial was going to last more than a month. Back then, there were plenty of court reporters and unlike today, nearly all major cases received comprehensive coverage. But given that the case was against the powerful Packer media company Consolidated Press Holdings, Staples anticipated that we would be lucky to get fair coverage, let alone an account that conveyed the flavour of Mackie's case. Staples' strategy was to present to the jury through his witnesses the history, characters and events that formed the dispute. I attended the court case every day and prepared a long report that I published in my own four-page tabloid newsheet. Back then, we were still experiencing the joys of offset printing that enabled easier access to publishing than the older hot metal system. In many ways, this form of publishing was similar to today's reporting blogs. Mackie's allegation was that the Telegraph had falsely reported his criminal record and his role in the dispute. The narrative developed by Staples was one of an exploitative mining company that was in cohorts with the Queensland branch of the Australian Workers Union, which had joined forces against the militant Mackie and the striking rank and file. Back in those days they were called bosses' unionists. Staples wanted the jury to understand the truth so that they could judge for themselves the Telegraph's character assassination of Mackie. I was in court the day that the jury found that Mackie had been unfairly defamed and awarded him $30,000 damages. Some members of the jury even embraced Mackie. As far as I can remember, Consolidated Press then successfully appealed against the judgement. I don't think there was a retrial because the first trial had been done pro bono and not even Staples could afford another trial. It was nevertheless regarded as a victory for Mackie. I distributed my small newspaper to thousands of people including many lawyers. In those days, there was no internet so readers were always on the look out for material that was independent. I learned from the Mackie case that courts can be used in creative ways to tell the truth but that running a trial is very expensive. This is why defamation laws provide very little opportunity for ordinary people who are 'done over' by the media to seek a remedy and why successful plaintiffs are usually privileged people. By now, my taste for trying to report hidden stories had been whetted. Because Informal or de facto censorship happens when stories are ignored, journalists and readers need to find ways to break those silences. It was also indirectly through Staples that I got my first 'leak'. Staples and Gaudron were good friends of Clyde Cameron, an ex-shearer who became Minister for Employment in the Whitlam government. The story goes that when the then Prime Minister Gough Whitlam told Cabinet that he was appointing the Attorney General Lionel Murphy to the High Court, Clyde said, "well if you're appointing Lionel to the High Court, I'm going to make Mary Gaudron a judge". That was a good decision because Mary who was then 31 went on to be the first Australian woman on the High Court. Clyde Cameron gave me my first serious news story which was a leaked copy of the guidelines that set out how Commonwealth Employment Officers officers should decide who could get the dole. They were directed to look out for hippies, long hairs and other undesirables. Later, I worked at Fairfax, SBS and Channel Nine. Over these years, we often received threats of defamation action but most of these turned out to be what are called 'stop writs'. All of this experience turned out to be very helpful when I taught media law at UTS for twenty years. I used to emphasise to students that they had to look beyond the text book to how defamation worked in practice. I also met some great defamation lawyers such as Bruce Donald who radically reshaped the previously very conservative ABC legal department in the 1980s. His new approach meant that lawyers worked with journalists to get their stories into a publishable form. More collaborative relationships meant that significant stories were published that might have otherwise never seen the light of day. Although the defamation laws were reformed in 2006 so that companies of more than 20 or so people can't sue, defamation still represents a significant threat to media freedom. Audiences never know whether stories they read were left unchanged or were cut to avoid the risk of ending up in court. If you notice that a media outlet stops covering a story or individual, it may be because they have been sued. Most cases are confidentially settled and never go to court but even these defamation actions use up precious investigative resources. This is all a long winded way of explaining why when I got a letter from Ash St lawyers threatening to sue me, I wasn't going to crawl back into my corner. But this isn't to suggest that defamation threats are not very intimidating, especially for a person or group without legal resources. I am also not pretending that the media cannot damage people or that the laws can't be used to protect people who are indefensibly defamed but unless you're rich or powerful, the risk of legal costs make it difficult to sue. No word yet from Ash St lawyers. I'll let you know what happens.